Copic Coloring Guide Blog Hop! Today we have information about the new book, beautiful coloring, stunning card projects… and BLOG CANDY! The Copic Coloring Guide is a new book by Colleen Schaan and Marianne Walker. It’s the perfect resource for both beginner and intermediate coloring artists. The book contains information about the different styles of Copic markers, explains the coloring/ numbering system, details how to pick good blending groups, teaches a number of blending techniques through illustrated tutorials and de-mistifies the colorless blender marker. And that’s just in the first 18 pages! The book also contains over 40 beautifully colored card projects separated into beginner, intermediate and advanced skill levels. Each card project includes step-by-step coloring AND assembly instructions along with supply lists and manufacturer information to make recreating the projects simple and easy. Here’s one of mine from page 28. On this card I’ve used Being Cute is What I Do by My Favorite Things and four different coloring techniques. They’re all explained in the book. You can do it! Really! I have two others in the book as well using images by Kraftin Kimmie Stamps. Would you like to win an autographed copy? Each of the contributing designers is hopping today and each one is giving away a copy of the book (signed by both authors and the designer). To be eligible to win, please leave a comment on THIS post telling us about your favorite image (or style of image) to color. I like to color people. The cuter, the better. 🙂 Posting will close at midnight on Saturday, July 9 and the winner will be posted on Monday, July 11. Be sure to visit each of the designers’ blogs to see their favorite projects from the book and for your chance to win a copy of your own! This entry was posted in My Designs, My Favorite Things. Bookmark the permalink. Oh wow! This is absolutely beautiful! So pretty – I like the CP paper with the PI and of course your coloring is beautiful. I can see why they wanted you for the book. Can’t wait to get my hands on it! I love coloring flowers! Sweet card! What a darling card. The image is so sweet. Wonderful coloring. I have just started getting some Copics to try. I would love to win this book. Thanks for the chance. Congratulations, Michele!! Your card is ADORABLE and so beautifully colored (hehe)! I love the yellow greens – YG01, YG21, and YG25. Green is my favorite color! Loved your card, Michele. It was adorable, thanks so much for sharing it with us. 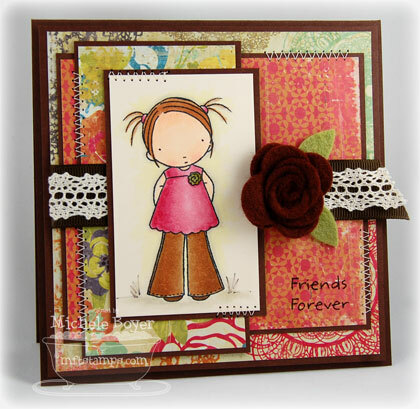 I love to color flower images, but I also love to color Magnolia stamps images as well. Love your MFT girl!! You are a busy lady! Okay my trio here is YG91,93,95. Oh golly – this is so, so beautiful. I like coloring anything with Copics but I guess my favorites are people and anything floral. your cards are awesome! I do not have any copics yet, as I do not know how to use them, so this book would be great for me! I like to color people with copics the flesh tones copic has can’t be matched elsewhere. Ok I need to read better – not my fav three colors everywhere…. oops more coffee needed today … I do love coloring people especially the Pure Innocence girls, Stampavie Sarah Kay and Lily of the valley kids!! I love floral images! I have a hard time with faces and hair. thanks for the chance to win this great book! My favorite images to color are florals. Michele, We are totally honored that you said yes! I am a HUGE fan of your work and I can’t wait to work with you again. Thank you so much for the beautiful submissions. HUGS! Cute card! I love MFT images. I think my favorite thing to color is flowers. Cute card!! I love MFT images. I think my favorite thing to color is flowers. I love coloring in flower bouquets, they have alot of chance to meld different colors so they look like watercolor. I love coloring anything vintage, but my favorites are landscapes. Your card is so very sweet. Thanks for the inspiration, this blog hop is amazing. My favourite style of image is definitely flowers! I love coloring images with my favorites being Magnolia’s. I love the open faces and the style. Allows me to get creative with my coloring. I love to color the Just-Rite stamps, Magnolia and my cutouts from the Cricut machine! this is just gorgeous Michele! i love to color cute critters & kids/people. i would love to learn more techniques! i was lucky enough to have Marianne as my instructor for the beginner’s certification this past May and i’m so eager to learn more!! thanks for the chance to win such an awesome prize! your shading is absolutely brill on this cutie! adorable card, as are all of yours! I am a big fan of pink and have several of the copic shades. but I am just beginning my collection so have a ways to go. I think coloring anything nature related would be a great challenge to undertake. Michele your coloring rocks! I totally love your style and glad we can be in the book together, I smile when I see your additions! This is some expert coloring – so much to learn. Great book and would love to own one! I am a beginner and own a few Copics. I love the smooth feel of the marker when it colors. Thanks for the opportunity to win this great book which I want and need so badly. I love girls in ruffled dresses with curly long hair! Wow!! This card is STUNNING!! I only WISH I could color this good!! My favorite things to color are flowers….but I’d LOVE to get as good as you at coloring people!! Thank you for the chance to win this book and become as good as you!! Love your projects in the book, Michele. I’m such a fan of your crazy Copic skills! See you soon, dear friend. I never thought I would say this because I love flowers so much, but I enjoy coloring in cute little kids the best. just starting using copics and do need a book, so thankyou for the opportunity. My fave to colour is flowers and animals, but really need to expand my area. This card is gorgeous…but your cards always are! I love florals and whimsical style people and animals…golly! Do I really have to pick a favorite??? lol Thanks for the chance! It would be amazing to have an autographed copy from one of my favorite designers!! Really stunning card! I love all of the lovely layers! Oh, and I like to color people the most! I love coloring the little kids from the Pure Innocence stamps. They are so adorable and become some life-like after coloring them with copics. So cute! My favorite images to color are Lockhart stamps. I would love to win a copy of this wonderful book. I am a sketch card artist and I love coloring characters with big bulging colorful costumes. Awesome card! I love coloring the Magnolia stamps; but love trying new stamp companies. Starting to use Paper Makeup Stamps, Simply Sassy, Wiff of Joy…I guess these all have cute people stamps….so fun! My favorite images are flowers. I am still intimidated by “people” images. So adorable and such a cute image…lovely entry! First off, can I just say I love anything YOU color the mostest?! I’m with you on coloring people, and the cuter the better is right! Congrats on being featured in the book! I love to color flowers. Sometimes I make them up and don’t use the color they truly are. Thanks for the chance to win, this will be a valuable resource for me. At age 67, after years of knitting, sewing, and some stamping, I am now addicted to card making. Having just begun, my supplies, equipment and knowledge are very limited. I do love to color flowers but at present cannot afford Copics. I love to color flowers. I love coloring simple images. Nothing with too much detail, otherwise I have a hard time getting the colors right and it looks messy! Cute card, The colors are all so pretty and go so well. My favorite things stamps are one of my favorite things to color. What a sweet card!!! My fav images are flowers; love all the challenge of shading them to make them look real, but could definitely use this book to help me learn!!! I love to color flowers and leaves, I am starting to learn how to shade better and now want to practice on stamped images of people. Thanks for a chance to win a copy of the book! I have just a few Copics which I purchased to color stamped images of flowers. I love the look and am so anixous to learn more about using Copics. Your work is fabulous! Great card! My favouite style of image right now are the Home Grown digital images from Funky Kits. Thanks for the chance to win. I reallllllllllllllly like Asian!!! Thanks for the chance to win this wonderful ‘how to’ book! I love floral and detailed images. This book is really nice (my friend has one) wonderful job! I love these MFT cards and they are wonderful to color especially with copics. I love images of kids especially big headed kids. This is an awesome giveaway. I’m totally with you … I love to color whimsical people! I would love pointers on coloring people. Looks as thou your card just might help me their and you have done such a wonderful job with it. Would so love to learn your techniques. I love to color flowers! Would love to be able to do people like you do! Super Cute Card! Love the MFT images! Congrats on getting published in the book. My Fav’s to color are Denami Mimi’s, MFT Pure Innocence, and Penny Black Hedgies. I like to color flowers in vases too. favorite images to color – definitely depends on my mood! most of the time it would be people – mo manning’s images or moonlight whispers (kraftin kimmie). I love to color people, too! The clothes, the hair, so many colorful opportunities! I do not have copics, yet, but have been eyeing them for awhile. I am just wondering where to start!? I love to color flowers. I love people too, but I have such a hard time with the hair, I can never get the highlights right. I do love line art and I usually gravitate towards flowers. Copics are the best for coloring. Hi! I would love to win the book, I just bought my first 33 copics on ebay but have not yet received them so I am new at this but I love to color nautical scenes and cute stuff with colors or watercolors. And your card is beautiful, I hope to learn to color with copics as well as you do! I’d love to get my paws on the book – I’ve never tried copics but love to colour with my watercolour pencils. Especially flowers. Beauties! I would absolutely lovvve to win the autographed Copic Coloring Guide. I need all the help I can get and this book sounds fabulous. My favorite images to color are people (Mo Manning images) and flowers. the opportunity to win a copy of the book. I think flowers are my favorite, although I’m just really begining to learn to use Copic markers and just getting into it – so that may change. Thanks so much for the blog hop and beautiful book – what inspiration! Great card. You blend beautifully. Thanks for sharing. I love coloring them all as the copics make things jump off my cards. Although as of late I have been using a tone of Coffee and Hero arts doughnut stamps with my copics. I love Copic’s and I especially love your card and coloring. Love the ribbon technique. I love coloring, just about anything. My favorite though is to color cartoons of people. Right now, I’m enjoying Hambo Stamps’ digital images, particularly of Wee Henry. Thanks for asking, and for sharing your beautiful coloring with us! I’m so ready to start my collection of Copic markers – I’ve dropped big hints to my DH for some for my birthday next month! 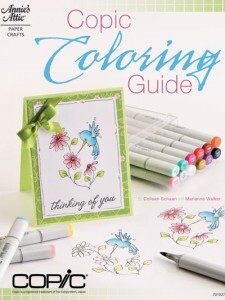 I would love to win this book to learn how to use them – love coloring! I love earth tones – not having any copics yet, I don’t have a color code to give….. Thanks for the chance to win this book – your card is awesome! Oh, thanks for the chance to win! My favorite images to color in are flowers–especially the snowdrops from JustRite or the roses from PTI! Love colouring all sorts of images – the MCC class on Scenic images with Copics was great, but I do like colouring cute images too. thanks for the chance to win the book! Just love the Papertrey Ink stamps to color..their images are so great..love the Tiny treats images ..the flowers picnic baskets..actually all their stamps. Have magnolia stamps too they are also fun to color. A very sweet card..love the colors. 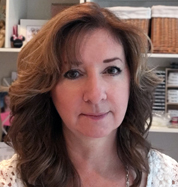 Michele, so happy you are working with Copic. This looks like something I’d like to do. You know how much I love to color. I don’t color often, as I don’t know how to blend or layer colors to make my images look real. I’m hoping that should I be lucky enough to win a copy of this publication, all that might change! Thanks for the chance! I love to do anything and everything. Since you have asked for something more clear than that, I have to say I love abstract trees. I use a lot of swirls and shapes to make little dreamy trees! My favorite style of image is flowers and nature. Flowers in particular. Thanks for the change to win. Love coloring by the way!! I love Copics. Favorites? Depends on what I am coloring. I use E13, E15, E19 a lot. I love Copics. My favorite markers depends on the project, but I do use E13, E15, E19 a lot. I love to colour almost anything – especially flowers. Absolutely love to colour with copics – gotta have them all. Thank you for a chance to win an awesome autographed book. I’m partial to flowers and homey scenes, such as a sofa and chair, a tea cup or a cabinet filled with pies. OK, how funny is this, I just told Debbie I love to color PIs — just like yours! So now I’m wondering if I left the wrong answer to her question, what do I like to color? Well, that’s my top choice, if I were choosing an image I would say one without too much detail because I’m still a baby with copics: shirt, hair, pants, face. So when I win this book I can grow in my abilities! Woo hoo! I love your site and I am always so happy to open your message to see what project you have created. You never disappoint. Okay, my favorite thing to color is people. I love doing the same image time and again with different colors of hair, clothes and skin tone. I need lots of help so I’m so excited about this new book. I gave up on coloring until I found Copics. Now with this new book, I might actually have a project leave my desk! ADORABLE card! I love to color cute kid images, just like this! Thanks for the chance to win! Fun card! I love coloring flowers. Thanks for a chance to win a great book. Your card is adorable! Like you, I love to color cute people, in particular, the Magnolia line of stamps. Thanks for the chance to win the book!! I love to color pictures of little girls, usually Magnolia and Mo Manning images. I would be so thrilled to win a copy of this book! I have been wanting to try Copics for coloring stamped images for the longest time but I don’t know how to and I’ve been too scared to try. Right now I only use colored pencils to color flower images, but I would love to learn how to use Copics to color cute people! My favorite images to color with Copics are flower petals. My favorite images to color are also people, I love some odd girl, cc designs, the type of image that has cute faces!!! I love coloring kids — I think I get the most inspiration from my own kids for them. Thanks for the opportunity to win. I love your card! The girl is so cute! I have only colored flowers so far, so that is my favorite for now. Such a sweet card. My favorite images to color are flowers. Any flower will do. They are also my most challenging images to color. Very nice job!!!! I love to color stamped images, of course. Cards and scrapbooking! I love Penny Black dogs and cats (and cows) and Whippersnapper. I love the cute kid images, but I never can get the skin color right. I like to color people too. Cute little girl images are my fav. probably because I have the cutest little 2 yr old girl at home. thanks for the chance to win a copy of this book. I have it in PDF but would love to have a book too. I’m with you…I like to colour people but I really want to get into flowers. Thanks for the chance to win such an amazing book! Iʻm a fan! I also am a subscriber of your blog -and I wait to see just what you have created everytime. Thanks for your inspiration and your wonderful creations. I love those Copics! I like coloring flowers and kids and I would love to win a book so I might get a lot better at it. Looking forward to getting the book to guide me on using copics. Coloring flowers will be fun to do with all the possibilities of shading. I have such a limited number of copics at this time. I am in the early learning stages. Your card is so darn cute. Thanks for the chance to win. I love to color big open flowers. They just come alive when you use the copics, but I need a class with alot of practice. I love coloring flowers and animals. I don’t feel confident enough in my people coloring skills yet! I would love to get a signed copy of this book How fun! I love to color flowers! Thanks for the chance to win! The the coloring on your cards. I appreciate the chance to win one of these wonderful guide books on coppices. I don’t understand what is going on with my computer, but it is changing the spelling of my words. My original note was…. I love the coloring on your cards. And I appreciate the chance to win this wonderful book. I love colouring everything! I’m enjoying colouring stamped images … some of my favourites are Tickled Pink Stamps .. but I think what I find an absolute delight to do is to create or colour embellishments with copics! Its such an awesome bonus!!!!! You colour your image and then can have the perfect co-ordinating embellishments! What a beautiful card, your coloring is amazing. Thanks for the chance to win. Awesome card….so sweet. I love to colour western designs, I’m a country girl thru and thru. Thanks for sharing. I love, love, love to color flowers! Thanks for offering such a wonderful prize! I enjoy coloring fantasy images. Fairies, unicorns, dragons, wizards and heros. The more detailed the better. I love spending 2-3 hours on one image and getting all the little details just so. Sweetpea stamps have some of my very favorite images, with some of my very favorite fantasy artists. Thanks for the opportunity to win a copy of the book. I would loooove to know more about the 4 techniques you have used on this sweet image Michele. My fave thing to colour, like you, is people….I have LOTS to learn though:-) Cheers! TREES, that is what I want to color with Copics. The seasonal changes should give me a good experience in coloring and this book will help me with that. I just received $50.00 dollars for my 67th birthday and I am going to start my copics collection..Sketchers I think is what I’m going to buy, and this book would be of such help to me. I’d love to be able to color with my Copics the way that you do! I mostly copy what examples I see at my stamp store in classes. I think the book would be great for the information on the theory of coloring. I use a lot of different colors in card making, but prefer the reds and oranges. Love your project. I love PI by MFT I also love using them as my card project or Bugaboo Stella/Guss any image by Bugaboo and just started using Some Odd Girls. They have great images. Yes most are people I love coloring them. i love using copics with A Muse Studio and the Greeting Farm stamps! Thanks for the opportunity to win a signed copy of the book! I hoope i get one! Hello! I love to color flowers! Thanks for the chance to win this book! I love to color all kinds of images, but my current favorite is the Kraftin’ Kimmie Moonlight Whispers characters like the Marie Antoinette. I would say flowers are the easiest to color. People – not so easy. I have yet to try skin tones. Thanks for sharing. I’m fairly new using Copics. I like to color flowers, but am branching out. I do have some Copics and I love coloring butterflies and flowers with them!! Gorgeous card!! I would so love to win this book to learn how to color with the copics!! SO cute!! I love coloring animals, Fred Bear is my favorite!! LOVE your card!! I love coloring dragonflies, although I just bought some really cute cupcake stickers by elizabeth craft that I’m having fun glittering and then coloring with copics. Love those little people! I also love to color florals. Thanks for the chance to win. I could really use this book! Im like you and I definitely prefer colouring the little people – some of my favourite lines are MFT and The Greeting Farm. Thanks so much for the hop! It depends on my mood…but I like to color people and florals! I favorite images to color (currently) are the cute little animals by Inky Antics. Thanks for the chance to win!! Fun and colorful card as usual! Love visiting your blog! I think I would like to be able to color and shade flowers to look realistic. My husband has a butterfly garden and I would love to be able to color a flower just as nature indended it to look! I love to color fairies, just in case I get the skin tones off it’s okay. My next best is flowers and leaves. Love your card! My favorite images are people and flowers. Thanks so much for a chance to win an autographed copy of the book!!! I love to color flowers and other botanicals. I like to color cute kids. But it depends on the occasion, because flowers are good too. Thanks for the chance to win this great book. my favourite image is flower but I also love to colour Magnolia Tilda. I love to color flowers. I love flowers in the garden too. Thanks for chance to win book. I like to color the Sarah Kay stamps. They are so cute!!! I like people too, and flowers. I love working on scenery and flowers. The scenery just because and the flowers because you can go wild! A lovely card! I love to colour flowers especially hydrangeas with their beautiful shades of blue or pink and lots of light and shade. I enjoy coloring detailed images, esp. flowers. Seems I stay away from larger images. I’m not surprised you like coloring people…you’re SO GOOD AT IT! Thanks, Michele! I don’t have a favorite color, because I don’t have Copics – yet. This book would help me get going with them and doing some of the fantastic things I see in your work. Just love your card, your coloring is awesome!! Wonderful job!! Hope some day I can be as good as you!! I also love coloring little girls, although I really like anything “cute”. I love to color flowers… so many color choices. I too, have just started using Copics and have been coloring flowers, a lot of flowers! Thank you for the opportunity to win. I would have to say landscapes. I love flowers, trees, anything outdoors. Thanks for the chance to win. Adorable card!!! WOW you are one terrific colorer! I like to color anything with flowers, I’ve also done a lamp and bird cage, those were fun too!! Thanks for the chance to win this book! You card is beautiful and the image is adorable. I love to color flowers!!! Thanks for the chance to win this wonderful book. Michele, what a cute card! I love to color flowers most of all! I love to color architecture. I have not braved the world of coloring people yet. Maybe this book would help me?? Love your card. I love coloring people – mermaids and flowers. Attempting some landscape also. Thanks for the chance to win this book. lovely card! I am looking forward to finding things I like to color lol. New to copics and other than coloring in coloring books I have not done much coloring. I think I am going to enjoy coloring nature scenes. Thanks for the chance to win this awesome book. Right now I find my self coloring flowers. I have some people stamps, but have not had the time to play with them yet.. Right now I am coloring a lot of flowers. I find these easier to practice on. I have some cute people and animal stamps I will be practicing with next. I love coloring flowers of all kinds, I find these to be among the easiest to do. I love coloring flowers and nature stuff. Thanks a ton! Love your card. I like to color anything…I buy a lot of white ribbon, flowers and well anything else so I can color it to match my project. Thought I’d better use the same name on all comments. Thanks for sharing! I love the colors you used. It is a great card. Such an adorable card and image!!! I’m with you – I adore images of people to color!!! MFT, Magnolia, Kenny K, Hanglar – those are the most commonly used images by me with people. Thanks for a chance to win!!! I sure hope to win the book! I love working with leaves! What a beautiful card – thanks for sharing! I like to color flowers. They are forgiving! People scare me at the moment. Hope I win so I can learn some of the tricks. what an adorable image! I’m afraid to color people, I look forward to learning from you. Sooooo Cute… you just want to HUG that little girl!!!! I would love to win a Copy of the Book. Thanks so much for the chance. I LOVE to color Backyard Birds. I need help (in more ways than one) with subtle color changes..
Oops, need to read directions – my favorite images are little girls – any and all types! I have 3 beautiful daughters and 3 adorable grand-daughters. Sorry if this is a double post, but it didn’t seem to post… I LOVE your card!! The little girl is soooo cute, you just want to hug her…. I am trying to learn to color Backyard Birds… Thanks so much for a chance to see your blog and win a copy of the book…. Your card is so cute and precious. Love your coloring and all the wonderful cards samples that are in the book. I’d dearly love to have an autographed copy of my very own. First I have to say that card is simply gorgeous. Can’t wait to see the whole book. Right now I am into coloring cutesy stuff — kids, animals — I also like flowers. Other times its all about landscapes or doodles. I love your card. My favorite images to color are flowers & cute critters. Thanks for a chance to win a super give away. I love to color flowers. The bigger, the better:-) I would love to learn how to colour people though. My favorite items to color would be flowers. I thought it would be people images, but when I look through my cards, I have very few of those and tons of flower/nature style cards. I love my Copics though and use them more than anything. Thanks so much for the chance to win! Love what you colored. Hope I can get close to that good. I love to color people, especially Bellas. I would have to say that kids are my favorite. You did a great job coloring your image!! I like to use Copics on animals. The shading makes them look really nice. I’m enjoying coloring people and flowers – at least right now! Ohhh that is just precious!!! I LOVE to color flowers and fruits….of course my faves are Gina K…..and cute animals like LOTV!!! She’s adorable and colored so beautifully! I’m like you, I love to color cute images too! Love to color flowers, fruit and text. Really like Artemio stamps from Belgium. They look great colored with Copics. Thanks for the chance to win! Cute card!! My favorite images right now are floral, especially Hero Art stamps. Thank you for the opportunity to win, would love to have this book. Love Copics and having this book would certainly help me increase my skill. I love YG11, YG13 & YG17 for leaves and grass and R83, R85 & R89 for roses. Thanks for the chance to win! Hello, I enjoy all the colors in the spectrum but my most favorite is blue. Most shades of blue are great! I love your card. Thanks for having the giveaway. Darling MFT stamp and that flower is adorable. Fav colors presently are BV0000, BV00 and BV01 as I play with flowers. Love your card. Looking forward to having this book. I like coloring flowers. Thanks for the chance to win. Your card is so good. Thanks for sharing your talent. I like to color animals. Love your card, great coloring. My favorite images to color are animals ~ turtles, hedgehogs, frogs, elephants – you name it! I like colouring House Mouse images. It has taken a while, but I think I have the hang of it! Thanks! Fabulous card! I bought copic markers to color cute people–like from MFT and TGF. I especially like to color flowers and trees, whether realistic or stylized. Thanks! I love to color people, esp. Magnolia stamps. Such a pretty card! I tend to color more images of flowers and leaves…probably ’cause that’s more of a comfort zone for me. thanks for the chance! I like the card you made and how you color the little girl. I like to color anything but my favorite is butterfly because they have alot of color on them. I would love to own some copic marker and then to learn how to color with them. Thank you for sharing. I prefer to color people. My current favorites are the “Girlfriends” stamps…they’re so funny. The way you color the flesh is so life like, it’s beautiful. I’ll stick with floral images. Hard question to answer… love them all, but how about flowers! I really like to color flowers and leaves. My favorite thing to color is always FLOWERS!!!!! I love your card. My favourite images to colour are also people. I currently love all the Marci and Luka images from La-La Land Crafts. Thankyou for the chance at winning a signed copy of the book. I love to color anything with Copics but my favorite things to colors are fruit images. I love the way the colors can combine to create a shape and dimension that wasn’t there in the flat surface. It is magic! girls. Thanks for a chance to win! I have the most success coloring small images like flowers or whimsical baby animals. I need a lot more practice and instruction especially in color selection to even attempt a person or large image. Thanks for the chance to win. I love your card. She’s simply adorable. Your card has so many layers and textures yet the girl takes center stage. Beautiful! Favorite images to color…that’s a tough one. My favorite has been butterflies because they have veins and it’s fun to leave brush strokes to get that effect. My favorite image to color is a flower like an iris or violet. I like to color images of flowers or berries with my Copics. Hi, I am a newbie at posting and coloring. The only trio of Copics that I have in the same family are RV11, RV17 and RV19. hmmm, seems like the latter 2 are too similar. But it looks like you used one or two of these colors and your sample looks wonderful. I Definitely need the book to learn how to blend. I love coloring flowers with Copics. You can get such depth and detail with the shadng capabilities. My favorite thing to color is wooden surfaces. I did a really cute wooden reindeer card. Loved it! The only think I have colored is flowers, so far that is what I like, lol. But I do have some robots to color, working up the courage, even have a tutorial! Hands down, it has to be florals. i like to color animals… i like cartoony, cute, cuddly animals (my recent was an elephant). Being new to Copics (meaning – I don’t have a one, but they are on my ever growing wish list). I’m in awe of the beauty they create, I only wish it was that easy. What a fab giveaway! This would be a great way to get into Copics in a grand way. I’m still pretty new and have a hard time with many images but I find flowers to be very relaxing to copic. I can’t wait to see the book! Hi, Your card is adorable! Well I only have one Copic at this time, it was a gift and I’m bitting at the bit to learn how to use Copics and start collecting them. I would love to find a class in my area but haven’t been able to so far (zip 53215) if anyone know of classes. I’d travel up to 50 mis. Anyway I’d have to say my favorite images to color at this time are flowers. Thanks for the chance to win this book! D.
I am new to copics and only have a few but I love to color flowers. My favorite colors right now are R81, R83 & R85. Thanks for an awesome giveaway. BTW, love your card too! Love your card! I like to color flowers. I am still collecting Copics so hope to be able to do more people. Thanks for the opportunity to win this awesome book. Such a gorgeous card. I just love how you’ve coloured her top, I always seem to find the tops on these girls a real challenge, she’s gorgeous and that little felt flower finishes her off beautifully! I love to colour little girl images, I actually love these little Pure Innocence girls too. Thanks for the opportunity to win such a fun prize! My favorite to color right now is Magnolia! I love to color just about anything! Christmas things has to be my favorite right now, as you know that will probably change in an hour! I really like to colour flowers! Some people too. I like to color nature images. I have trouble with peoples faces. I love the one you did. i am just beginning my journey with copic markers so i am not very experienced. i enjoy coloring any of the images i use on cards and projects for my family and friends. i like using the ripe avocado trio from paper trey inc. YG95, YG95 & YG 97. thanks for an opportunity to win! At this point, I tend to favor coloring in the detailed parts of flowers but since I’ve never even used Copics, I really need this book!! I love my copics and the favorite images that I like to color are flowers. I am a novice with the copics but am happy to have a chance to win so I can improve. I like to stamp cards with flowers and shade and color them. I am very new to copics – right now I’n working on faces/skin – I’m using MFT stamps of little girls – so cute. My favorite images are the Simply Adorable digital images from Sugar Nellie. The detail in them is awesome. I love to color flowers w/ copics! I am fairly new to Copics – love them all. To choose 3 favorite colors, I will go with B93, B95, B97. Oops, can I edit my anwer? I am enjoying coloring my people stamps. I like to color holiday images, and Copic has so many colors you can find one for anything you want to do. I enjoy coloring images of all sorts but would really like to learn to paint birds so they look like they have feathers! At the moment I don’t own Copics but am intrigued that they are blendable and don’t streak. Thanks for the chance to win this wonderfully promising book! I love to colour cute kids – there are so many terrific stamps out there! I love coloring embellishments to add to my cards and scrapbook pages. It is awesome to take a plain white embellie and color it to totally match whatever I want. LOVE IT!!!! I like to color images of people. I have recently signed up for a Copic class at CKC Valley Forge…I can’t wait to give it a try, I can only wish to color so beautifully as this. I’m sure I’ll have a favorite before long. Thanks for the opportunity to win Copics! I can’t wait to get this book! I just love to color anything with my copics! Such an adorable card, love it! Honestly, I love coloring…period! I guess my favorite type of images to color would be people, or animals, or flowers…aw heck, I can’t choose a favorite! 🙂 Thanks for the chance to win! Darling card! I’ve shied away from coloring because (shhhh) i don’t know how. 😮 When I do color it tends to be Vintage images, animals, scenes but not so much cutesy stuff. Adorable card! I am just beginning with Copics and so far my favorite are floral images. Thank you for the chance to win! Wow! Beautiful card. I like to color flowers. They come in so many different beautiful colors and shapes. I enjoy coloring everything with my Copics! Currently people and floral images are my favorites. Your card is very sweet. I think I would enjoy coloring flowers the most. I need to start with smaller images. I am hoping to add more copics to my collection. I would have to say I like to color animals the best. But I am pretty new at this. Awesome book! I like to color stamped images of animals – then I don’t have to get the colors right on! Thanks for the chance to win! I love to color characters! I love the Kraftin Kimmies and Mo Manning designs. I also like Magnolia designs. But there are not too many images I do not like to color! Thanks for participating -your work is beautiful. My favorite images are the darling little Pure Innocence cuties like you have done in your wonderful sample. I also like The Greeting Farm images to color. Thanks for the chance!! Just learning Copics so can’t color much but would LOVE to color people. I sure admit how you gals make them come to life! I like to use Copics on everything but feel most comfortable coloring flowers. What a lovely cute card! I always enjoy colouring flowers, but lately I’ve coloured quite a few people. I actually enjoy making them different shades, tanned, darker pigmented, pale. I also love coloring the cute children images. But would love to color more floral and especially like your beautiful card you made. Need to know more, so would love to win the guide. Thanks! Hi, I like to colour hair. I have so much fun with the different combination of hair colours and choices. Thanks for the chance to win this amazing guide. This book looks awesome. I just started using copics and don’t have much experience using them but I can imagine coloring some awesome flowers, animals and people! Great book! I like to color flowers and detailed small images like some of the Karen Lockhart ones. Your card is so cute. I would love to win a copy of this book. Right now my favorite image to color are people, I am fianlly getting a little better at coloring them. Gorgeous card. I am quite new to Copics…would really love to learn and this book would be perfect.Thanks for giving a chance to win. Your card is so dang cute! I love your coloring, and this book looks wonderful! my favorite images to color are flowers especially the hero arts hydrangea. I love to color non-living objects like kites, pinwheels, balls, sand, chairs. Silly, I know, but that is what I like. I love to color flowers of any kind: Single ones, bunches, gardens and flowers in vases and jars. Can’t wait to see the book! I like to color lots of things! 🙂 My favorite, it looks like I have a lot of flowers ready to be colored, so that’s what I will go with, flowers. Thank you for a chance to win the Copic Coloring Guide. I enjoy coloring anything floral with my Copic pens. The book looks like a dream come true for Copic users. My fave is probably the pure innocence ballon girl. I love to pop the balloons and the little dress. Still learning about copics. The book would be wonderful! I think my favorite is flowers. Your card is so cute! I love your coloring. I understand why you like coloring people. You do it so well! Your card is adorable! I have the “Coloring Techniques For Card making” book also published by Annie’s Attic because I was one of the artists in it. I drooled over the Copic artist’s work! I mostly had water coloring in it. I would sooo love to win a book dedicated to Copic coloring only. I really need to work on mine! Adorable card. I can’t imagine being skilled enough to combine 4 coloring techniques! I’m sure The Copic Coloring Guide would certainly help, lol! Thanks for the chance to win. I would love to have more information about coloring techniques!! I like coloring both people and flowers. I like to color flowers and landscapes. I would love to win this book. I’m not sure what my favorite is at this time for I’m just starting and i see some very, very, very talented peoples’ creations (works of art). Flowers are my favorite to color; thanks for the chance to win this book! Like doing skin tones with Copics. Still working on the hair part. Love to color people. Love how the skin looks so natural. Your card is so sweet and such beautiful coloring. What a great resource the book will be! BG72,75,78 is my fav’s right now… Beautiful job on your card! Have colored flowers before using markers & a blender pen but don’t own any Copics. Your card is a super example of how detailed one can color with the right colors of Copics. Thanks for the chance to win! My favorite is the ocean. And anything in or on it. I would love to have a copy of the book. I bought the book at my local craft store and love the tutorials. I’m looking forward to trying all the techniques. I am so loving coloring and copics are the markers of choice for me! I love coloring flowers just because I haven’t perfected people, who knows maybe at the next blog hop it will in fact be people! Thanks for the opportunity to win the book! I guess I saw this too late but I still want to say congrats! How cool to be published in it! I am new to copic markers. A quilter who has expanded her wings. I want to learn, wish I had taken some art classes instead of band. This book would help lots. Just recently relocated and have finally found a place that has some copic classes so I am excited.! To live a short and exciting life is far better than to live a long and boring one. All content (including text, photographs, and design work) is © Michele Boyer. Original artwork is shared for personal inspiration only and may not be copied for contest submission or publication.